City needed an accurate GIS basemap to increase productivity and public service. ArcGIS Survey Analyst helped integrate survey documents and land records to create a new cadastral fabric. GIS allowed the city to enhance its cadastre using survey methodologies. Five diverse communities make up the coastal town of Encinitas, California. From the north, the Batiquitos Lagoon borders Leucadia, a beach community known for the giant eucalyptus trees that line Pacific Coast Highway (PCH). Inland is Olivenhain, an area that boasts a valley of open pastures, ranches, and rural living. From the south, San Elijo Lagoon borders the rolling hills and beach cottages of relaxed Cardiff-by-the-Sea. The center of the city, known as New Encinitas, advertises a golf course, shopping centers, and new homes. In contrast, Historic Encinitas attracts weekenders, beachgoers, and locals with quaint caf�s and coffee shops, fine dining, window shopping, and waves. Each of these unique San Diego County communities was an independent entity until 1986, when they were incorporated as the City of Encinitas. The City of Encinitas' new cadastral fabric shows an approximate 15-foot difference between the city's old lot lines (green) and its new fabric lines (red). Once united, Encinitas became a 22-square-mile city with six miles of Pacific coastline, a flourishing flower-growing industry, and more than 150 miles of public streets. Although each community was celebrated for its distinct cultural history, the union introduced a hodgepodge of land records and survey documents that contradicted one another and were not spatially accurate. Brought together under the management of the City of Encinitas, the inaccuracies provided geographic challenges that were not as visible when managed individually by the County of San Diego. To help overcome the city's new geographic challenges, Encinitas' mapmaking and planning departments began using GIS in 1990. A decade later, the city adopted a plan to enterprise its GIS. Once implemented, the ArcSDE technology-supported information, scheduling, and workflow system, known to employees as City GIS, became the main vehicle for distributing data throughout the city. Simultaneously, City GIS also became a platform for Encinitas' cadastre and GIS basemap, which departmentssuch as Public Works, Engineering, and Fire and Marine Safetyand the San Dieguito Water District began using daily to service Encinitas' public. As more departments began depending on City GIS to function, a better cadastre and reliable basemap became increasingly significant and the next priority for Encinitas' ever-evolving City GIS. "Many departments within the city rely on our GIS to work smarter and to provide services to the public, so our basemap must be configured correctly," says David VanPelt, GIS project manager for the City of Encinitas. "The cadastral maps of the past were not created with the degree of care and precision that is required in today's environment. They need to be more spatially accurate so they align better with our aerial photography, infrastructure, water, and sewage map layers in City GIS." After a lengthy planning period that included input from department stakeholders and a resource and cost analysis, Encinitas decided it would first update two pilot sections of its GIS basemap, then complete the remaining cadastre after a quality-control process. The city chose Seattle, Washington-based Weston Solutions, an Esri Business Partner, to build a new cadastre for the two sections using existing source data, survey documents, and land records provided by the city. Both parties agreed that the task, as well as Encinitas' short- and long-term needs, could be met using the tools and workflow presented in ArcGIS Survey Analyst with Cadastral Editor software. ArcGIS Survey Analyst includes a new dataset called the cadastral fabric, which stores both a continuous parcel fabric that covers a jurisdiction and survey-based subdivision plans without losing information relating to the original survey record. Upon Weston Solutions' delivery of a new cadastral fabric, Encinitas' GIS department could then use survey methodologies in the ArcGIS Survey Analyst environment to independently manage and continually enhance its new cadastre. The city chose an area located in Historic Encinitas, where parcels are plenty, survey records are less accurate, and survey control is sparse, as the first section to receive a new cadastral fabric. In contrast, the second pilot section included an area in the eastern part of Encinitas, where ranch lands and subdivisions are few but large. The dissimilarities in the two areas would give the new cadastral fabric a real test of its eventual citywide usage. An early step for both sections was to improve the city's survey control points, which were not adequate enough to meet the accuracy available in the cadastral fabric model dataset. To strengthen its survey control, the city collected additional control points using Real Time Kinematic (RTK) surveying methods. 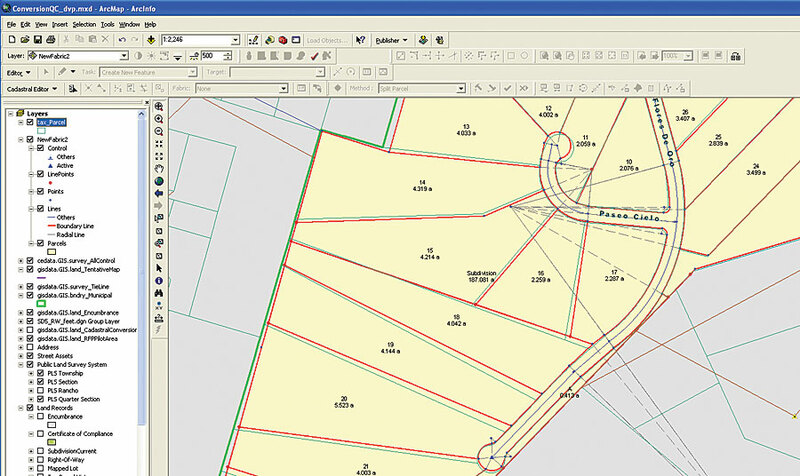 Once the new control points were added to the fabric, Weston Solutions used the least squares adjustment function in Cadastral Editor to adjust and connect the parcel boundary lines in the cadastral fabric. In Cadastral Editor, a least squares adjustment accurately and incrementally updates and adjusts parcel boundaries and related layers, such as roads, building footprints, and easements, as new data and control points become available. 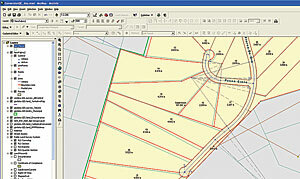 Since receiving its new pilot sections of cadastral fabric, the City of Encinitas has been in a quality-control phase, where it checks the fabric's accuracy by confirming that all survey documents and records are accounted for in the fabric, the required attribute fields are populated, appropriate control points are used, record values from source documents are correctly reflected, no parcel misclose errors exist greater than six inches, and common points are truly common. These steps are crucial to ensure an accurate GIS basemap alignment and to recognize where extra care is due. "Once the quality control and the basics of our basemap are complete," says VanPelt, "we will use the inherent tracking of accuracy in the cadastral fabric to determine where we'll need additional RTK work to tighten up the fabric. That sums up the benefit of the least squares adjustment. It will automatically keep all our map layers in line when something in the cadastral fabric is adjusted, such as the addition of a control point. It will allow us to maintain our cadastre accurately and in a rigorous fashion." For more information, contact David VanPelt, GIS project manager, City of Encinitas, California (tel. : 760-633-2652, e-mail: dvanpelt@ci.encinitas.ca.us). Learn more about ArcGIS Survey Analyst with Cadastral Editor at www.esri.com/surveying.